Twenty years ago, the Wheaton Alumni magazine began a series of articles in which Wheaton faculty told about their thinking, their research, or their favorite books and people. 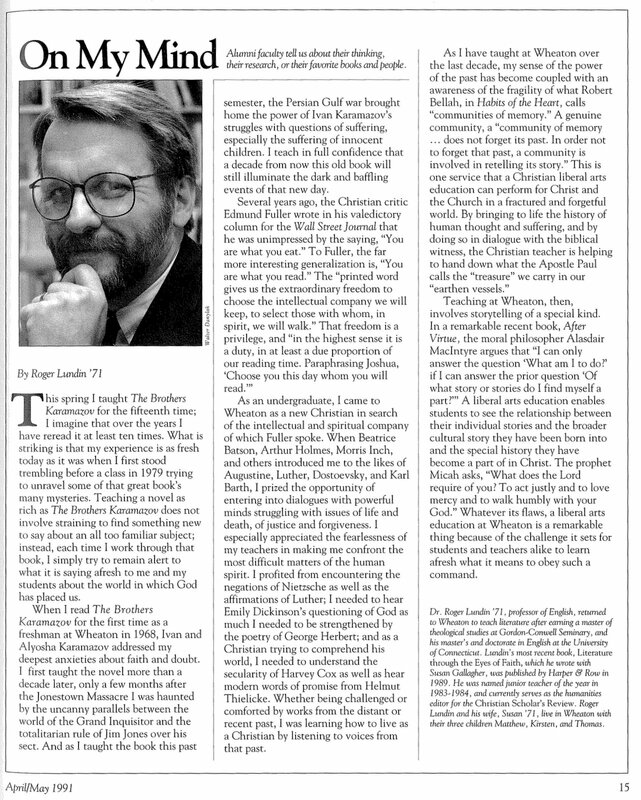 Blanchard Professor of English Roger Lundin was featured in the April/May 1991 issue. This spring I taught The Brothers Karamazov for the fifteenth time; I imagine that over the years I have reread it at least ten times. What is striking is that my experience is as fresh today as it was when I first stood trembling before a class in 1979 trying to unravel some of that great book’s many mysteries. Teaching a novel as rich as The Brothers Karamazov does not involve straining to find something new to say about an all too familiar subject; instead, each time I work through that book, I simply try to remain alert to what it is saying afresh to me and my students about the world in which God has placed us. When I read The Brothers Karamazov for the first time as a freshman at Wheaton in 1968, Ivan and Alyosha Karamazov addressed my deepest anxieties about faith and doubt. I first taught the novel more than a decade later, only a few months after the Jonestown Massacre I was haunted by the uncanny parallels between the world of the Grand Inquisitor and the totalitarian rule of Jim Jones over his sect. And as I taught the book this past semester, the Persian Gulf War brought home the power of Ivan Karamazov’s struggles with questions of suffering, especially the suffering of innocent children. I teach in full confidence that a decade from now this old book will still illuminate the dark and baffling events of that new day. As an undergraduate, I came to Wheaton as a new Christian in search of the intellectual and spiritual company of which Fuller spoke. When Beatrice Batson, Arthur Holmes, Morris Inch, and others introduced me to the likes of Augustine, Luther, Dostoevsky, and Karl Barth, I prized the opportunity of entering into dialogues with powerful minds struggling with issues of life and death, of justice and forgiveness. I especially appreciated the fearlessness of my teachers in making me confront the most difficult matters of the human spirit. I profited from encountering the negations of Nietzsche as well as the affirmations of Luther; I needed to hear Emily Dickinson’s questioning of God as much I needed to be strengthened by the poetry of George Herbert; and as a Christian trying to comprehend his world, I needed to understand the secularity of Harvey Cox as well as hear modern words of promise from Helmut Thielicke. Whether being challenged or comforted by works from the distant or recent past, I was learning how to live as a Christian by listening to voices from that past. Teaching at Wheaton, then, involves storytelling of a special kind. In a remarkable recent book, After Virtue, the moral philosopher Alasdair Maclntyre argues that “I can only answer the question ‘What am I to do?’ if I can answer the prior question ‘Of what story or stories do I find myself a part? '” A liberal arts education enables students to see the relationship between their individual stories and the broader cultural story they have been born into and the special history they have become a part of in Christ. The prophet Micah asks, “What does the Lord require of you? To act justly and to love mercy and to walk humbly with your God.” Whatever its flaws, a liberal arts education at Wheaton is a remarkable thing because of the challenge it sets for students and teachers alike to learn afresh what it means to obey such a command. Dr. Roger Lundin ’71, Blanchard Professor of English, returned to Wheaton in 1978 to teach literature after earning a master of theological studies at Gordon-Conwell Seminary, and his master’s and doctorate in English at the University of Connecticut. He was named junior teacher of the year in 1984 and senior teacher of the year in 1995. Some of Lundin’s published works include: Literature through the Eyes of Faith, Emily Dickinson and the Art of Belief, and Believing Again: Doubt and Faith in a Secular Age.